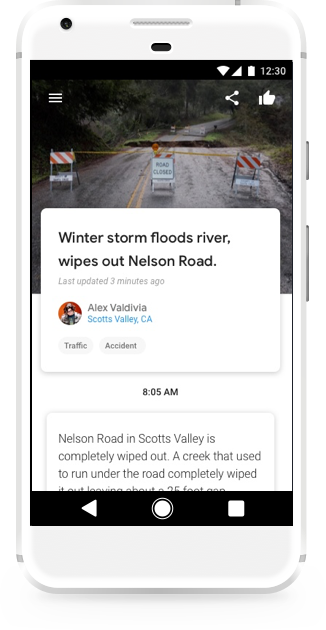 Google is testing a tool called Bulletin that would allow anyone to publish local news stories and events, according to a report from Slate, which Google later confirmed. The company described Bulletin as a way for others to communicate information of local interest, like bookstore readings, high school sporting events, or information about street closures, for example. Slate found a website for creating Bulletin posts was already up-and-running, but was still in “early access mode.” The service is currently being piloted in Nashville and in Oakland, Calif., the webpage states. On the site, Google explains that Bulletin is a lightweight app for telling stories, capturing photos and videoclips from your phone, and then publishing them straight to the web – without having to create a blog or build a website yourself. “If you are comfortable taking photos or sending messages, you can create a Bulletin story!,” the website reads. At a launch event in Nashville, a Google spokesperson also said that Google wanted to work with local news organizations to help them find and publish some of the stories posted to Bulletin, while giving the author credit, according to Slate. The move to delve into local news would have Google competing with other services where people already share news about what’s happening locally. Specifically, people tend to tweet or live stream when news is breaking – like if they witness an accident, a fire, a fight, a police chase, or something else of a more urgent and distressing nature. Meanwhile, if they’re trying to promote a local event – like a book signing, to use Google’s example – it’s likely that they’ll post that to the business’s Facebook Page, where it can then be discovered through the Page’s fans and surfaced in Facebook’s Local app. And if Google aims to more directly compete with local news resources like small-town print or online publishers or Patch, it could have a tougher road. Hyperlocal news has been difficult to monetize, and those who have made it work aren’t likely interested in shifting their limited time and energy elsewhere. But if Google wants a piece of this kind of action, it should have just bought Twitter years ago.